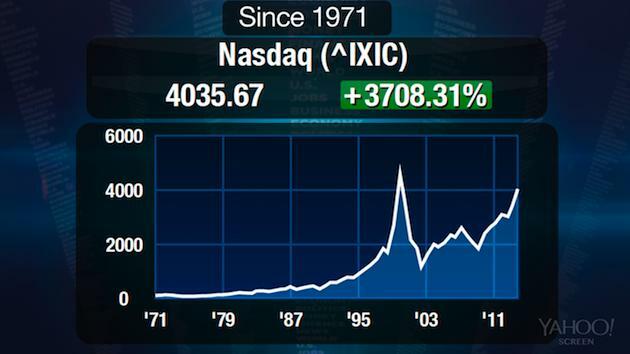 The Nasdaq (^IXIC) topped 4,000 last week for the first time in 13 years and has continued to hit new record highs. But should investors be worried? Not yet, says Barry Ritholtz, chief investment officer of Ritholtz Wealth Management and creator of The Big Picture blog. The Nasdaq today is a lot different than the Nasdaq during the tech bubble, he says. "The composition of the Nasdaq has actually changed," Ritholtz explains in the video above. "It used to be very tech heavy. Now it’s probably about a fifth less tech heavy than it was." Matt Krantz of USA Today writes that technology stocks account for 42% of the Nasdaq composite, down from 51% in March 2000. Also, says Ritholtz, "[the Nasdaq] is a lot more reasonably priced today. The last time we were at 4,000 a huge percentage of the stocks on the Nasdaq had no profits. We coudn't even talk about a P/E ratio. It was essentially nonexistent." That's not the case today. "Probably the priciest stock is Google (GOOG), trading at about 23-24 times earnings," says Ritholtz. He discounts Amazon's (AMZN) P/E because even though the company's growth "is spectacular they're just not making any money yet." Related: Will Earnings Season Kill the Stock Market Rally? So where are stocks headed next? "We've had a huge run for the past four years so you could say this rally is a little long in the tooth," says Ritholtz, "but it's possible given the new trading range we've entered on the Dow (^DJI) and S&P (^GSPC) that perhaps this is the beginning of a new secular bull market. But I'm not quite ready to say that yet." Among the reasons for Ritholtz's hesitation: "There are no alternative investments" to stocks because of near-zero interest rates, he argues. "Everybody has more or less been forced into equities." At the same time, he says investors should remember the crashes of 2000 and 2007-2008. "You have an investment audience that is fairly shell-shocked and very doubting of any sort of long-term gains," he notes. Tell us where you think stocks are headed in the comment section below!